During the years 1949-1964 there was a growing realisation, confirmed by results from experiments conducted by Porton Down scientists, that a large area of the UK could be contaminated with simulated biological warfare agents by a single ship or aircraft. Experiments using the BW simulant, Zinc Cadmium sulphide, had shown that a spray aircraft, flying along the coast of the UK, could contaminate an area as large as 10,000 square miles from a distance of over 100 miles from the target area. This method of BW attack became known as the Large Area Coverage (LAC) concept. During the early 1960s, scientists from the Microbiological Research Establishment Porton Down were tasked to investigate whether similar results could be obtained by using live bacteria instead of the chemical compound (ZnCds) that was used in previous experiments. It was quickly realised that the Porton Range (area 7,000 acres) was far too small to be used in any of these proposed experiments. The Director of the MRE Porton Down, Dr D W Henderson, then suggested that spraying the bacteria at sea and detecting the resulting aerosol cloud inland might be a successful operational method, and so a search began for a suitable trials site in the UK. According to declassified MRE Porton Down documents, South Dorset was eventually selected as the trials site because it met with three important, and still valid, requirements. (1) Lyme Bay is semi-circular (radius 25-30 miles) which allows the use of any wind direction between 070 through south to 280 degrees. (2) It has a nearby dockyard (Portland Naval Base, now Portland Port PLC) which facilitated the spray ship. (3) It is only 50 miles from the laboratories of Porton Down, which enabled overnight examination of radioactively labelled antibody samples. A suitable base for the mobile laboratory (codename Night Ferry) and control vehicle (Golden Arrow) was found at Fleet, a few miles west of Weymouth. This base was Crown Property and overlooked the main trials area, Lyme Bay. The nearby Moonfleet Hotel provided accommodation for the MRE Porton scientists. On 14th November 1963, the Experimental Trials Vessel ICEWHALE slipped from Portland Naval Base and sailed around Portland Bill to Lyme Bay. At 13:19 Porton scientists started the spraying apparatus and for the next 33 minutes the ETV ICEWHALE sailed in a straight line across Lyme Bay, disseminating a massive aerosol cloud of live bacteria from its stern. During this first trial ,the ETV ICEWHALE sprayed 108 litres of bacterial suspension. By the end of the first trials season (October 1963- April 1964), the amount of bacterial suspension used in each trial had risen to 488 litres. The spray suspension consisted of two types of bacteria. The first, Bacillus subtilis (also known as Bacillus globigii or BG), had been often used by Porton Down either as a simulant for anthrax or as a tracer organism. It was sprayed in its spore form in order to ensure survivability. In December 1997, John Chisholm, Chief Executive of the Defence Evaluation Research Agency (DERA, a part of the Ministry of Defence) admitted that “BG may cause disease in immunocompromised people.”. The strain of BG used in these experiments was obtained from the US Army Biological Warfare Laboratory at Fort Detrick. In May 1998, Dr John Reid, then Minister of State for the Armed Forces admitted that staff at Porton Down had been unable to find evidence of routine toxicity testing of the imported BG prior to its use in these experiments. The second type of bacteria that was used was E.coli MRE162. This organism was isolated from a toilet at Porton Down during 1949, and given the MRE culture number 162. Both types of bacteria were sprayed in live form and were designed to be the same size as real Biological Warfare (BW) agents- between 1- 5 microns. This size is used in BW to ensure that the bacteria bypass the body’s natural defences and reach the deepest parts of the lungs, the alveoli, where they can more easily cause infection. Still frames from an animation of the trials procedure; showing the spray ship sailing a straight line track across Lyme Bay and disseminating bacteria- the resulting massive bacterial aerosol cloud is carried onshore by the prevailing wind- mobile teams of Porton scientists attempt to sample the cloud as it travels inland. Apart from four preliminary experiments, all Lyme Bay trials that were carried out during trials seasons 1 and 2 (Oct 1963-Apr 1964 and Oct 1964- May 1965), were conducted during the hours of darkness. It was important, for experimental reasons, that the E.coli MRE162 was not subjected to daylight. Operating in the hours of darkness also added to the aura of secrecy which accompanied these Top Secret experiments. to give a rough indication of the track of the bacterial cloud. The Control base at Fleet, near Weymouth looking NE. In the foreground and covered is the radar unit. The MRE Porton Down Control vehicle, the Golden Arrow, is immediately behind. This picture shows four specially converted Land Rovers, each equipped with various types of air sampling equipment. In the immediate foreground is the MRE Porton Down mobile laboratory- Night Ferry. Air samples obtained by the mobile sampling teams were incubated here and the amount of bacteria obtained from each sampling location were counted. The results of this process were used to give a crude indication of the dosage received by persons exposed to the bacterial cloud. Forecasting the path of the cloud was critical in order that the mobile teams could be placed in locations suitable to obtain a good air sample. Sometimes this was not achieved. On one occasion, Trial 14 (24th April 1964), none of the five mobile sampling teams managed to collect any air samples from the cloud. The ETV ICEWHALE then sailed a straight line track of 17.6 miles while spraying 488 litres of bacterial suspension. Mobile teams were positioned in the predicted path of the massive cloud at distances of between 18-20 miles from the source. None of the mobile teams were able to collect any air samples of the bacterial cloud. The trial was a failure. These trials, which were in effect Biological Warfare attacks (albeit only using simulated BW agents), continued for many years. The first two trials seasons, 1963-64 and 1964-65, included investigations to determine whether live bacteria remained viable after travelling a distance of 50 miles or more; to investigate the concentration of viable bacteria present in the aerosol cloud; and to investigate whether these bacteria would still react to anti-sera after a long distance of travel. The latter experiments were considered necessary for the development of Biological Warfare detection equipment. The straight lines indicate the track of the spray ship; the numbers on land indicate the location of the sampling positions. Again, the straight lines indicate the track of the spray ship; the numbers on land indicate the location of the sampling positions. During this second trials season, Porton greatly expanded the trials area and made use of the whole of Lyme Bay and surrounding countryside. The resulting bacterial aerosol clouds, generated from a ship sailing either in Lyme or Weymouth Bay, were detected as far west as the edge of Dartmoor in Devon, and as far east as Ringwood in Hampshire. 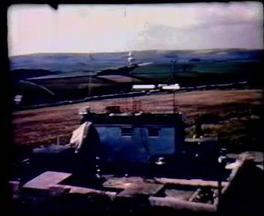 During 1966, the MRE Porton Down returned to South Dorset and conducted a series of comparative BW experiments which investigated the problems of detection and early warning. The trials area for these experiments was primarily south and west Dorset. As before, massive amounts of live bacteria (E.coli and BG) were sprayed from ETV ICEWHALE and samples of the resulting aerosol cloud were obtained by mobile teams of MRE Porton scientists. The results were compared with the findings of other trials (the microthread trials) that were held simultaneously in South Dorset. These microthread trials involved exposing bacteria held on spider’s threads (microthreads contained in boxes) to the same air as the Lyme Bay trials. Previous Lyme Bay trials had indicated that air from urban sources had a deleterious effect on the viability of E.coli. This bacterial killing process was known as the Open Air Factor (OAF). During 1967-67, MRE Porton Down conducted a new series of trials in Dorset which investigated whether E.coli particles could be shielded from the OAF by coating them with a protective substance, codenamed S3. Two spray runs were made by ETV Icewhale during each trial i.e. along a reciprocal course. The first run sprayed live BG and unprotected live E.coli, the second run sprayed live BG and live E.coli with S3 added to the suspension. Three trials were done under conditions with presumed OAF presence and two under conditions where little or no OAF was expected (OAF was believed to be in high concentration when air had previously passed over urban areas and absent or in low concentration, when the air had not). Microthread exposures were also made at one of the sampling sites. The results from these experiments indicated that it was possible to protect the bacteria in a BW aerosol cloud from the deleterious effects of the Open Air Factor. Unfortunately, addition of Porton’s protective substance, S3, considerably increased the dosage of E.coli cells to any Dorset residents who were exposed to these trials (source- MRE Field Trial Report No 6). The minutes of a meeting, held at the MOD Main Building during February 1969, show that the MRE Porton Down had now reached a point where further research could not be continued without a specific Service requirement, or without information from the Services on their operational needs. The meeting agreed that the MRE should undertake a Feasibility study of development of a suitable BW detection system for the Services. This Feasibility study led to the implementation of a Naval General Air Staff Target which in turn led to further Biological detection experiments. It was realised that the comparison of performance of different Biological detection systems would be useful. The UK had developed the Radioactive Labelled Antibody Technique which was capable of detection of specific BW agents, and the US had three BW detection systems which gave warning of the presence of a BW aerosol cloud, but not of it’s specific content. Lengthy negotiations between the US and the UK continued during the spring and summer of 1971. These were mainly concerned with the logistics of conducting comparison trials between the many BW detection systems. Discussion ranged from which bacteria would be sprayed in order to challenge the systems in realistic field conditions, could the US provide the Serratia marcescens bacteria should it be decided to use it in the trials, would the US provide their own generators etc. It became obvious that the comparison trials should be held in two locations. Challenges of the systems in a European battlefield conditions could be conducted on the 7,000 acre Porton Range in Wiltshire, and the maritime challenges could be made at the Admiralty Underwater Weapons Establishment site at Portland Bill, Dorset. 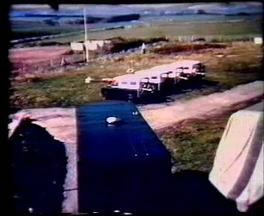 During November 1971, scientific teams from the MRE Porton Down, US Army and US Navy came together at the Admiralty Underwater Weapons Establishment site at Portland Bill, Dorset. The ETV ICEWHALE was once again used to generate the bacterial aerosols which were carried onshore by the wind and then sampled by the UK/UD biological detection devices. The bacterial strains used in these trials were BG and a US favourite, killed Serratia marcescens (SM). Some blank challenges were also made with aerosols of phenol. In total, 16 challenges were made during these trials. During 1975, similar collaborative UK/US experiments were conducted at Portland. This time 24 challenges were made, the bacterial aerosols (BG and SM) being generated from a MRE Land Rover lashed to the deck of the Fleet Tender WHIMBREL. When evidence of all of these public area experiments became public knowledge in the late 1990s, Dorset County Council joined Weymouth and Portland Borough Council and Purbeck District Council in calling on the Government to hold a Public Inquiry to investigate the experiments. The Government declined to hold a Public Inquiry but instead commissioned an independent member of the Royal Society, Professor Brian Spratt FRS to conduct an Independent Review of the possible health effects of those exposed to the bacterial aerosols that were disseminated during the trials. Professor Spratt did find that on a number of occasions, scientists from Porton Down had exposed the public to massive aerosols of suspensions contaminated with an unknown bacteria. “in the event of a military question arising which could only be answered by conducting open air trials in areas which may involve the general public Ministers have made it clear that they cannot rule out conducting larger scale trials in the future to try to ensure the protection of the UK from attacks by people of states using chemical and biological weapons.”. When questioned about possible Porton Down biological warfare research, conducted since the events of September 11 2001, Dstl Porton Down will only state that they do not comment on research matters.